The Internet is the biggest enemy of broadcasters. Every since the existence of Television there has been people opposed to it, mostly because they complained about the poor morality or lack of in TV’s content. However, the number of people who chose not to have TV for this reason was not too alarming for broadcasters. It was until recently that this became an issue after millions rapidly stopped watching TV. The reason for this was not so much moral objection but because more material became available through the Internet, mobile phones, tablets, and other technology gadgets. 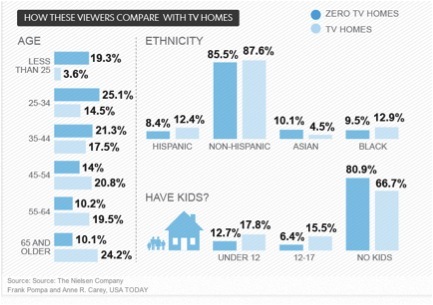 According to a Nielsen report, the number of “Zero TV” households is increasing; it went from two million households in 2007, to five million in 2013. The “Zero TV” households have started to make an impact on broadcasters’ revenue, so much that it was one of the main issues addressed in the annual meeting of the National Association of Broadcasters (NAB) in Las Vegas this year. “Cord cutters” damage broadcasters more than networks because networks can make money from online video providers. Broadcasters on the other hand, make money from the programming they transmit in traditional one-to-everyone methods, the Associated Press reported. According to Associationsnow.com, broadcasting live TV signals to mobile devices is possible, and more than 130 TV stations in the United States are doing it, but the number of people who have the tools to receive those signals is relatively small. A Nielsen study showed that the majority of “Zero TV” households are composed of young, well educated, wealthy, and childless members. For the advertisers this creates a problem because they know that if they advertise through broadcast television some of its potential buyers will not see their ads. 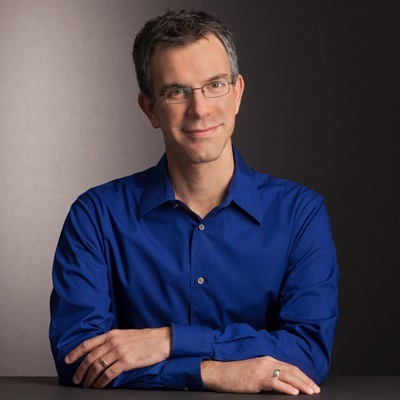 For Southern Methodist University professor, Derek Komapare, the definition of “Zero TV” households does not mean that they do not watch TV at all. 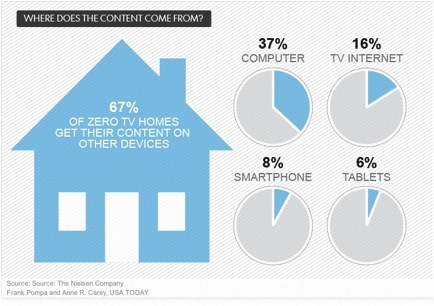 Actually 75% of these homes have at least one television set. 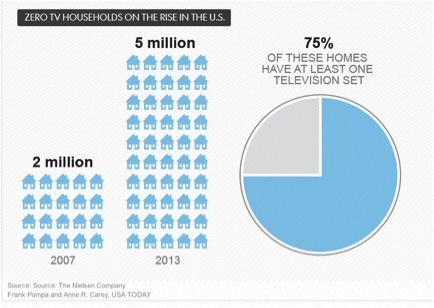 Plus, the total number of “Zero TV” households is less than 5% of the total population of Households in America. Kompare argues that in this case broadcasters are obviously affected but they still have options because at this rate it will be a long time before broadcast TV becomes obsolete. He says that broadcasters have two options: bring viewers back in or adapt. As long as the broadcasters figure out a way to still create revenue regardless of the amount of people actually watching TV, they will remain in business. 02 May	This entry was published on May 2, 2013 at 8:15 am and is filed under curiosities, TV. Bookmark the permalink. Follow any comments here with the RSS feed for this post.